Not just dog friendly, more dog centred. Serving Hound and Human. Wet dogs and muddy wellies wholeheartedly welcome! 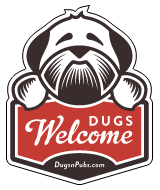 Well behaved dogs on a lead welcome (Pool Room & bar area only) for mucky pups towels are provided in the foyer. There are a total of 3 dog friendly listings in the Hebden Bridge category. Please log in, or sign up as a member to view all listings.